A mechanic was flown in to fix the issues, but the election supervisor says "we don't have a lot of assurances." 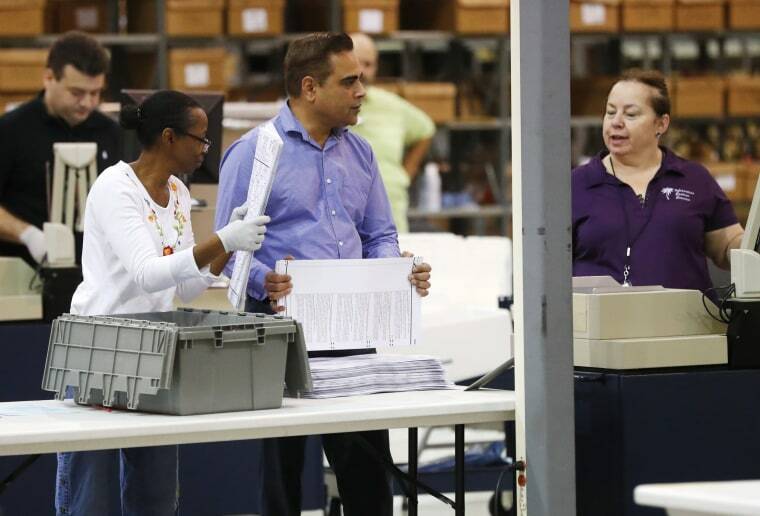 WASHINGTON — The Palm Beach County elections supervisor says aging equipment has overheated, causing mismatched results in the recount of ballots in Florida's U.S. Senate race. Supervisor Susan Bucher said Tuesday night that the 11-year-old machines began having problems on Monday as early voting ballots were being counted. When the numbers were crunched on Tuesday, they didn't match. WPTV says a mechanic was flown in to fix the issues, but Bucher says "we don't have a lot of assurances." She says the machines "started overheating so as a result the tally types are not reconciling properly." That means about 174,000 early voting ballots in the state's third most populous county will have to be recounted. That amounted to more than a day of work by Palm Beach County election officials being lost, according to The Miami Herald. Palm Beach is the only county in the state that uses a type of equipment — made by a now-defunct company — that can only recount one race at a time, The Palm Beach Post reported. According to the Post, $11 million was set aside for new equipment, but not purchased, because the state is still figuring out how its voting systems must comply with the Americans with Disabilities Act. Bucher said Tuesday night that she didn't think it was "very responsible to spend $11.1 million on new equipment that's not going to be viable in 2020," the Post reported. Workers are working around the clock to count the vote, but Bucher has already said they will not meet the state's Thursday deadline to report the recounted votes. Nearly 600,000 ballots were cast in the county.